THE Talk To Phil & Dave show on Pulse 98.4 Community Radio is a weekly programme that is co-hosted by Phyllis Joyce and by me. Every Tuesday, from 2pm until 4pm, we seek to address serious issues affecting the lives of ordinary people in an unchallenging, down-to-earth setting while at the same time delivering a light-hearted entertainment package. 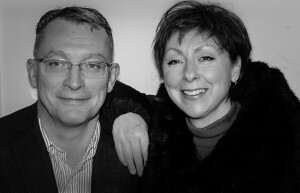 Phyllis and I are extremely proud of our show – which brings together a unique blend of agony aunt advice, music and social media – and we believe it to be unique on radio in Scotland, if not the United Kingdom. It is our aim to assist people wherever we can, and we subscribe to the principle of the “spirit of giving”. We wish to give of ourselves as professionals – Phyllis as a body-centred therapist and addiction counsellor and I as a journalist and media consultant – in order to improve the lives of others. The programme also features a number of original concepts that were developed by Phyllis and me, including the One Sentence Horoscope, Dave And Phil’s Dish Of Food and Three For The Price Of Two. Another unique feature sees us create podcasts through the editing of recordings of the show. These give lasting life to interviews with guests who have shared information on subjects of a topical or critical nature. The show also guarantees the anonymity of those who decide to reach out for help by directing them to use a dedicated email address or referring them to the Talk To Phil website (www.talktophilnow.com), where they can sign up through an email form. Only the details of the issue at hand will be broadcast. The website is home to Phyllis’s Problem Exchange, which provides insights into real-life scenarios involving people who have asked Phyllis for guidance. It is also a repository of critical support material, including the show podcasts. Pulse 98.4 , which transmits on the 98.4 FM frequency, is a community radio station based in Barrhead, near Glasgow, broadcasting to all of South Glasgow, the city centre, East Renfrewshire, Paisley, Renfrewshire and Clydebank and online. Two things set Pulse aside from other community radio stations – it is professional in its approach and it has no set music policy, allowing it to give exposure to a wide range of styles and artists. Pulse 98.4 is also available online at tunein, which lets listeners around the world access 70,000 live global radio stations, with music, sports, news, talk, and comedy streaming from every continent. It also has more than two million on-demand programmes, from podcasts to concerts to interviews. The tunein app is compatible with all smartphones and tablets and on more than 200 platforms such as Sonos and Logitech.